Open floor plans are highly sought after these days in all styles of homes, from modern condos to traditional houses. The multifunctionality and feeling of extra space with large, open rooms are powerful, but there can be a downside. Large, open spaces can feel endless and unstructured, and can miss the distinct personality that makes individual smaller rooms feel intimate and homey. 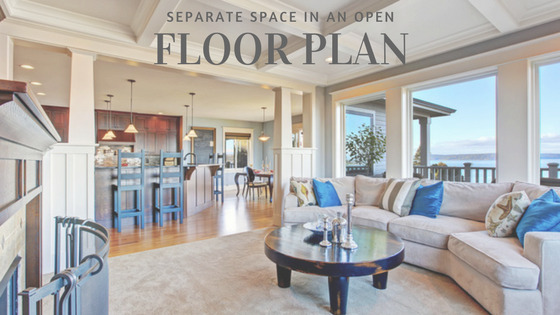 To get the best of both worlds, try these tips for visually dividing your floor plan into distinct zones, without the need for walls. 1. Grouping. One of the main ways we define zones within a floor plan is so fundamental, it is easily overlooked: grouping furniture. Placing furniture in close proximity automatically causes the brain to process those pieces as a group. This is why in the example shown here, the desk and chair (which are close together but far from everything else) feel like a clearly different group from the rest of the furniture. However, just positioning a few items near one another doesn’t necessarily give that group its own personality that makes it feel like a special space. That’s where the rest of these tips come in. 2. Color. Color is extremely powerful in defining the style and mood of your home, and it can help define your space plan as well. Notice how in this example, the kitchen is almost entirely neutral, while the adjacent sitting area incorporates a strong presence of the color blue. These two areas harmonize due to having a lot of overlapping colors, but the fact that only the sitting zone has such a high concentration of blue gives it its own life. 3. Metallics. You can use color more subtly with metallics. The small dining arrangement seen here has the same white and soft gray color scheme as the nearby fireplace sitting area. But multiple elements in golden metallics in the fireplace area set the two apart. Switching or highlighting a particular metal finish cues the brain that each area has a different energy, even though the color palette doesn’t seem to have changed. 4. Angles. To enhance the effect of grouping your furniture without buying a single new piece, try putting one furniture grouping at a new angle, such as 45 or 30 degrees (rather than the expected parallel or 90 degrees). Even just a slight change in angle can make a furniture group feel like a new little “room,” and you’d be surprised how sometimes an unusual angle can really help furniture fit into a space better. 5. Rugs. Area rugs are a go-to way to define zones, but they’re most effective when large enough to fill an entire (virtual) space, rather than simply floating between the furnishings. Notice how the living room zone here is defined by a rug that reaches to just a few feet from the walls, so the flooring underneath becomes a border around it. 6. Lighting. A pendant light over a dining table is a popular look (as in the previous photo), but it can be even more powerful when defining other spaces. The placement of this modern pendant over the sitting area defines the point as a center, which gives the eye a subconscious indication of how large that zone is — we can see how far the pendant is from the wall, and we automatically assume that zone ends at the same distance in the other direction. In other words, hanging a pendant where you imagine the center of a sitting area to be will help make it a visual reality. Want to add an overhead light while avoiding construction? Retro arc lamps (which these days feel more modern than retro) create the same zone-defining effect as a pendant light without the need for complicated electrical work. 7. Dropped ceiling. Speaking of complicated electrical work, sometimes it can seem nearly impossible to add lighting in a space with a concrete ceiling not suited to taking on fixtures. This is where a dropped ceiling works on multiple levels. The drop itself helps define an area below (such as the dining area shown in this project I designed), while providing a space to run electrical to a chandelier or house recessed potlights. 8. Ceiling accents. The ceiling can also be effective for breaking up a room without a full dropped panel. A simple beam or bulkhead draws a line across the room (one that you can’t trip on). 9. Furniture walls. Putting up a new wall may not be an affordable solution. Instead, solid, weighty pieces like a sofa table or low bookshelf backed against a sitting area can create a visual divider that elegantly caps off a space, without stealing much square footage or getting in the way of circulation.